University of Houston (UH) professor Suncica “Sunny” Canic is a mathematician, not a medical doctor, but her research could save the lives of heart patients. Working with collaborators from Houston Methodist Hospital on a minimally invasive experimental procedure for heart valve replacement, Canic’s work could lead to optimal design of an alternative to open-heart surgery for treating failing heart valves. Specifically, together with Dr. Stephen Little, a cardiologist at Methodist, Canic is leading an interdisciplinary team to improve the treatment of dysfunctional heart valves. With the number of patients requiring valve replacement on the rise, Canic and her colleagues are working to design new strategies in a minimally invasive procedure called Transcatheter Valve Replacement (TVR). Their approach would minimize post-procedural complications and provide a safe alternative to open-heart surgery. An emerging treatment for patients with failing valves, TVR entails implanting a prosthetic valve through the skin, using catheterization to forgo more invasive surgery. Going through the groin area, a catheter containing a replacement valve is guided to the location of the failing valve. Canic says the stent holding this bioartificial valve is made of a shape memory alloy that assumes a predefined shape optimized for TVR procedures once it reaches the patient’s body temperature of 98.6 degrees Fahrenheit. When the catheter reaches the location of the failing valve, the stent expands and anchors the bioartificial valve in place. Canic’s research group at UH’s College of Natural Sciences and Mathematics includes Hugh Roy and Lillie Cranz Cullen Professor of Mathematics Roland Glowinski, assistant professor Annalisa Quaini and several postdoctoral associates and graduate and undergraduate students. Her team is considered a leader in developing mathematical and computational techniques analyzing the interaction between fluids and structures, such as blood and cardiovascular tissue. The methodology they are developing is based on new computational approaches for providing stable, computationally efficient algorithms for valve motion, coupled with a novel approach to endovascular stent modeling. Recognized as one of the leading experts in the world in the area of mathematical modeling and scientific computing related to cardiovascular science, Canic recently was honored at the 2014 Society for Industrial and Applied Mathematics (SIAM) Annual Meeting held in July. 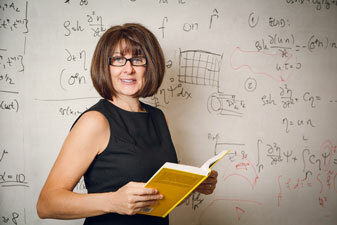 Canic, a Cullen Distinguished Professor in the Department of Mathematics, was named to the 2014 SIAM Class of Fellows for her outstanding contributions to the development of mathematical theory and applications to the life sciences. Her interdisciplinary approach to studying TVR promises to provide a major breakthrough in the treatment and imaging of heart valve repair.